As I made my way to the Royal Albert Hall last night to tick off yet another challenge on my Brighter Life List, I started thinking not about just how lucky I am to be reaching the finish line, but about all the people that are about to get started. It is a cruel fact of life that as one of us walks out of those hospital doors occupied with thoughts of a new normal, someone is walking in. I guess that’s why those doors are revolving! I was reminded of this fact not because I was about to enjoy a rare evening out, but because I had been fiddling with my travelcard wallet. I appreciate it’s not usually an object to inspire such thinking, but this wallet is no ordinary wallet. Tucked inside are quotes and messages sent to me over the years by my amazing dad. He always knows how to make me smile even though he is miles away. Aside from the occasional loaded highlighter markings that accompanied my bank statements when he used to send them to me at university, I have treasured each one of my dad’s clippings and motivational post-it notes. So, I’d like to share one with you today. It’s not profound. It’s not Booker Prize prose. 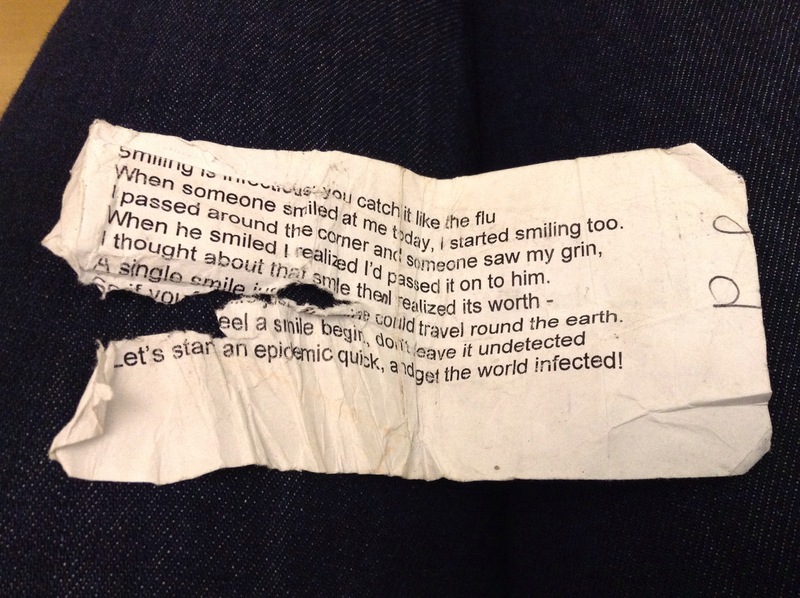 It looks like a tatty scrap of paper because it has been travelling with me for years. But it makes me smile every time I read it. This is for everyone facing up to challenges in their life – cancer or no cancer. Life is hard and, smiling when you’re faced with the biggest challenges it can throw at you makes it even harder. But, life can also be beautiful too. When he smiled, I realised I’d passed it on to him. A single smile just like mine could travel round the earth. Now that’s one epidemic of which I want to be a part! I have been reading a bit of the Dalai Lama of late in my attempt to find out more about theories of happiness. I love what he says about suffering and the fact that, if we spend our lives trying to find ways to remove it, we will be hit harder when it finds its way in. Because guaranteed, it will always find its way in. He believes that if we accept the inevitability of human suffering, we will be happier. I do believe that, and I also believe that happiness and suffering do not sit at either end of life’s colourful and challenging spectrum. Whatever you are facing, think not of the day the suffering will end, but of all the ways you can smile your way through it today. It often feels hard to find happiness, but trust me, there is more than enough of it to go around! I’m smiling, and I have a date with a linear accelerator (only three left to go)!